-'Ere, are you the bloke-, er, officer what was in charge of the nuclear detergent in the last atomic war? - Bad news - it has been returned to sender and there's three and nine to pay on it in Chinese dollars. Those nice people at the BFI have finally realised that there is treasure house of British film curios that are begging to be released. And, well, they've started to reintroduce them into the wild. The Flipside strand, already a bastion of screenings at the NFT, not only drags the weird and wonderful of British film blinking into the harsh light of day but it also spruces them up and presents them in HD too. 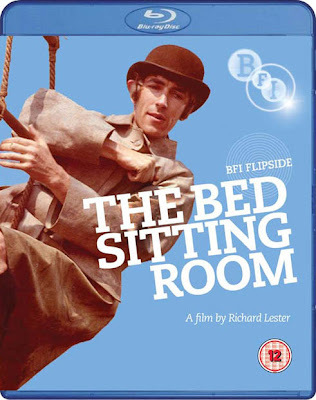 Richard Lester's The Bed Sitting Room, a film, as he describes in the Bernard Braden interviews that appear on the DVD, 'provoked' by the original John Antrobus and Spike Milligan play has rarely been seen beyond its initial theatrical release in 1970. It apparently sat on the distributors shelf for a year because they couldn't quite figure out what to do with it. I think the last time I saw it was on television back in the early 1980s. Made in 1969, it describes the aftermath of a 'nuclear misunderstanding' (with the Cuban missile crisis likely the inspiration when the play was first performed in 1963) that lasted two minutes and twenty eight seconds including the settlement of a tenancy at 10 Downing Street between Harold Wilson and Mao T'se Tung. A veritable who's who, or should that be whom were who, of British comic actors and theatre greats make up the cast of this slice of surrealism and Beckettian absurdity. The fact that the majority of them are now dead adds a peculiar poignancy to the proceedings that I'm sure would have helped the original audience take the film closer to its bosom. It was a commercial flop and received a mixed critical reception, taking the wind out of the sails of Lester's career. 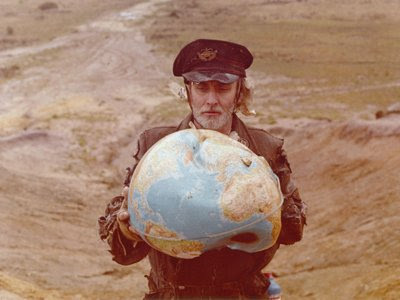 And yet its bizarre romantic notions of a peculiarly British struggle amidst desolation, radioactive mutations, poison gas and starvation, of a population kidding itself that there could be some form of survival beyond such a conflagration, still held sway at least until the mid-1980s. The film's insistence that the bastions of British society would continue beyond a nuclear attack were misconceptions still being trotted out during the Thatcher and Reagan embrace over nuclear proliferation and in dramas like Threads. We all know quite categorically that there were, and are, enough weapons en masse on either side to obliterate everything but here at the least the film is playfully conceited and is in on the joke. The BBC is personified by a laconic Frank Thornton who pops his head into broken television sets to read the news (a year before Python's similar visual motif); the NHS is represented by Marty Feldman dragged up as a nurse called Arthur anxiously administering to patients whether they want his attention or not; and the Army solely commanded by Ronald Fraser who has to deal with the British nuclear deterent being returned by post with a carriage charge on it. It's suggesting that a two minute exchange of nuclear firepower is a mere inconvenience when you've got to get to the doctor for a checkup because you fear you're mutating into a bed sitting room or your perfectly living and breathing wife has just been issued with a death certificate by a man in a nurse's uniform. 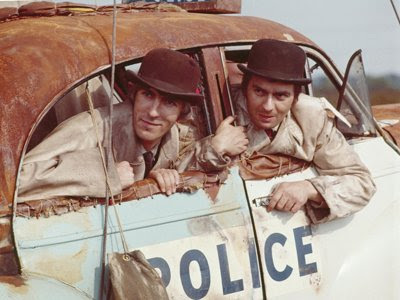 With its tip of the hat to Beckett, specifically Waiting For Godot and Endgame, the film expands on the original play and is a progression through the stages of late 1960s life, a post-nuclear society in which a nuclear family must adapt or die, where the rigid structures of post-war British society were changing despite an attempt to cling onto a vision of class, marriage, religion and behaviour that the previous generation had fought a war to uphold. Like Beckett, life is viewed as stark, hopeless and ironic, where language has a shifting meaning and communication continually breaks down. The characters have a profound desire to prove their existence and make sense of the world through routines and rituals - watching the news, keeping appointments, replaying domestic arguments, ensuring that people 'keep moving' and enshrining the monarchy by crowning the Queen's charlady, Mrs Ethel Shroake. Charles Wood's script showcases the futility of relationships in such an extreme situation, a sort of post-apocalypse keeping up of appearances. The bomb may have dropped but there's no excuse for loitering. All the main characters are attempting simply to "get through" and take comfort in the small things and in each other. The majority of them are alienated, psychically, physically, and sexually except for Penelope, played by Rita Tushingham, and her boyfriend Allan (Richard Warwick) both of whom represent the hope of a next generation. 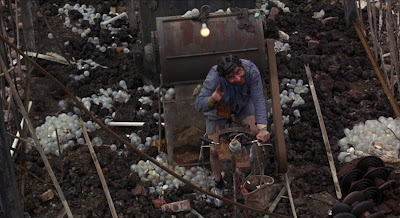 The film is a series of overlapping situations with the barest of plot focusing on Mum, Dad (the wonderful Arthur Lowe), Penelope and Allan leaving the safety of their Underground Circle Line train, powered by electricity generated by one man on a bicycle, and going in search of help to deliver Penelope's child, now due after a 17 month pregnancy. In the process, we meet the aforementioned representatives of British institutions and observe Lord Fortnum, a dazzlingly brilliant Ralph Richardson, declare that he is mutating into the said bed sitting room of the title. 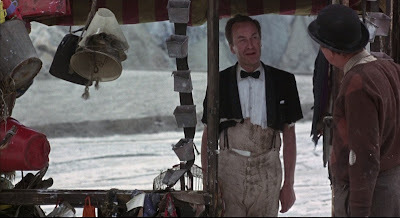 Richardson does become a portentous voiced rented accommodation (sounding very similar to his portrayal of God in The Time Bandits) and Penelope is married off to a local GP, played with easy eccentricity by Michael Hordern. Mum, the film's most appealing character, in a beautifully delivered performance by the sweet Mona Washbourne, is declared dead by Feldman's Nurse Arthur and promptly transmogrifies into a cupboard, declaring 'get your hand out of my drawers' as Michael Hordern attempts to climb inside her. It isn't full of belly laughs but if you liked the absurdist humour of The Goons or Milligan's later Q series then this will probably appeal. One moment that did have me laughing out loud is when Mum crashes through the ceiling of a bomb shelter and meets Harry Secombe who takes an instant shine to her because she's willing to sexually satisfy him by hurling bits of crockery and other objects at him in a mock domestic argument. Better still is the look of the film and Assheton Gorton's fantastic production design provides bizarre and surreal vistas - a massive mound of broken crockery, the dome of St. Paul's peeping out of the ground, the fused glass of Nurse Arthur's make shift hospital, the one man electricity generator cycling in a field of old light bulbs, HRH Ethel Shroake on horseback underneath an arch way of disused kitchen appliance doors. Its forensic examination of the British way of life and the nonsensical etiquette that dominates it mark it out as a predecessor to the equally subversive Brazil(1985). It's a curiosity and for a film released at the end of the 1960s it schizophrenically looks backwards to the death throes of Empire in the 1950s and forward to a utopian future. However, it posits a utopian fantasy with a twinkle in its eye, suggesting that it's just a dream and that the heady optimism of the 1960s was already being replaced with the come down of the 1970s. It's still a strangely uplifting moment though when Peter Cook waxes lyrical about the future, Penelope and Allan produce a normal child and adopt Dudley Moore, who has mutated into a dog. The BFI present the film in a very clean 1080p HD transfer and it's great to see it looking this good. The sound is lossless mono but the big problem here is that it is far too low with the mix being generous to Ken Thorne's brassy score and crippling the quiet dialogue. You really have to crank up the volume to listen to this properly. Bernard Braden's uncompleted series Now And Then, from which all the unedited rushes were donated to the BFI, provides three interesting interviews, one each with Lester, Milligan and Cooke. You also get a full colour booklet containing essays, reviews and plenty of colour images. Overall an excellent package to start off what will hopefully be a fascinating range of oddball British films. Stills courtesy of Channel 4 and screencaps courtesy of DVD Beaver.